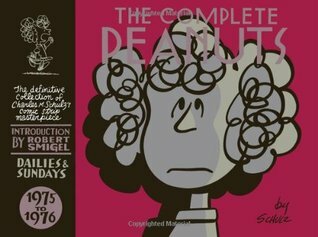 From Goodreads: The twelfth volume of Peanuts features a number of tennis strips and several extended sequences involving Peppermint Patty’s friend Marcie (including a riotous, rarely seen sequence in which Marcie’s costume-making and hairstyling skills utterly spoil a skating competition for PP), so it seems only right that this volume’s introduction should be served up by Schulz’s longtime friend, tennis champion Billie Jean King. This volume also picks up on a few loose threads from the previous year, as the mysterious “Poochie” shows up in the flesh; Linus and Lucy’s new kid brother “Rerun” makes his first appearance, is almost immediately drafted onto the baseball team (where, thanks to his tiny strike zone, he wins a game), and embarks on his first terrifying journey on the back of his mom’s bike; and, in one of Peanuts’ oddest recurring storylines, the schoolhouse Sally used to talk to starts talking, or at least thinking, back at her! The Complete Peanuts 1973-1974 also includes one of the all-time classic Peanuts sequences, in which Charlie Brown’s baseball-oriented hallucinations finally manifest themselves in a baseball-shaped rash on his head. Forced to conceal the embarrassing discoloration with a bag worn over his head, Charlie Brown goes to camp as “Mister Sack” and discovers that, shorn of his identity, he’s suddenly well liked and successful. From Goodreads: That’s right! 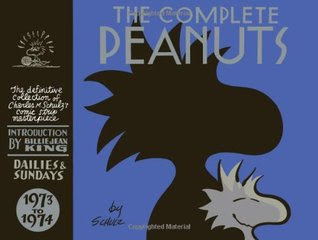 With this volume, The Complete Peanuts reaches the halfway point of Charles M. Schulz’s astounding half-century run on the greatest comic strip of all time. These years are especially fecund in terms of new canine characters, as Snoopy is joined by his wandering brother Spike (from Needles), his beloved sister Belle (from Kansas City), and... did you know he had a nephew? In other beagle news, Snoopy breaks his foot and spends six weeks in a cast, deals with his friend Woodstock’s case of the “the vapors,” and gets involved in a heated love triangle with Linus over the girl “Truffles.” The Complete Peanuts 1975-1976 features several other long stories, including a rare “double track” sequence with two parallel narratives: Peppermint Patty and Snoopy travel to participate in the Powderpuff Derby, while Charlie Brown finally gets to meet his idol Joe Shlabotnik. And Peppermint Patty switches to a private school, but commits the mistake of allowing Snoopy to pick it for her; only after graduation does she realize something’s not quite right!Plus: A burglary at Peppermint Patty’s house is exacerbated by waterbed problems... Marcie acquires an unwanted suitor... Charlie Brown and Peppermint Patty become desk partners... The talking school building collapses... Lots of tennis jokes... and gags starring Schroeder, Lucy, Franklin, Rerun, Sally, and that vicious cat next door. It’s another two years of Peanuts at its finest! Featuring an introduction by comedian Robert Smigel . Thoughts: 1975 - 1976 marks the half way point of this series of books. Sad to think we are on the downhill run. I continue to enjoy this series, especially as viewing it through the eyes of an adult is completely different from seeing as a child. My heart breaks for Peppermint Patty - no child should be made to think they are stupid. I love Linus' continued devotion to his blanket. Lucy's certainty that her and Schroeder are meant to be together and Schroeder's equal certainty that they're not. Best of all, I like the way they all work their way through the year, never getting up, sure that this year will be their year. The Complete Peanuts 1973 - 1974 and 1975 - 1976 both get 4 stars.